It's time for another fabulous sketch from Freshly Made Sketches and this week our resident Queen of Layers, Narelle, is our hostess. As we're coming into Spring here in New Zealand, I decided to go bright and cheerful with my card. This is one of the quickest cards I've ever made! I adhered two strips of washi onto a white card base to start. I had a whole bunch of these flowers and foliage die-cut and stamped from a previous card, so I put them together into a bouquet using Press 'n' Seal. I glued that onto the card base, colored the flowers with Wink of Stella and stamped the sentiment from a NBUS stamp set and I was done! Thanks for visiting! 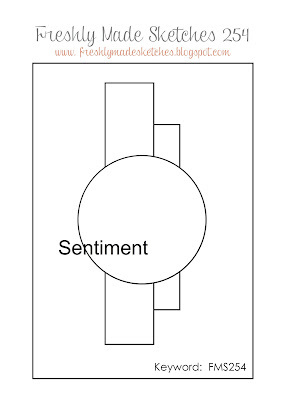 The DT have some beautiful cards using this sketch, so I urge you to check them out. I love your use of washi tape, too! Such a pretty card! love everything about your card - wonderful soft colors with that great design!! What a brilliant idea to use washi tape for this sketch! And your spring bouquet is so pretty! That's a whole lot of card for so little time! 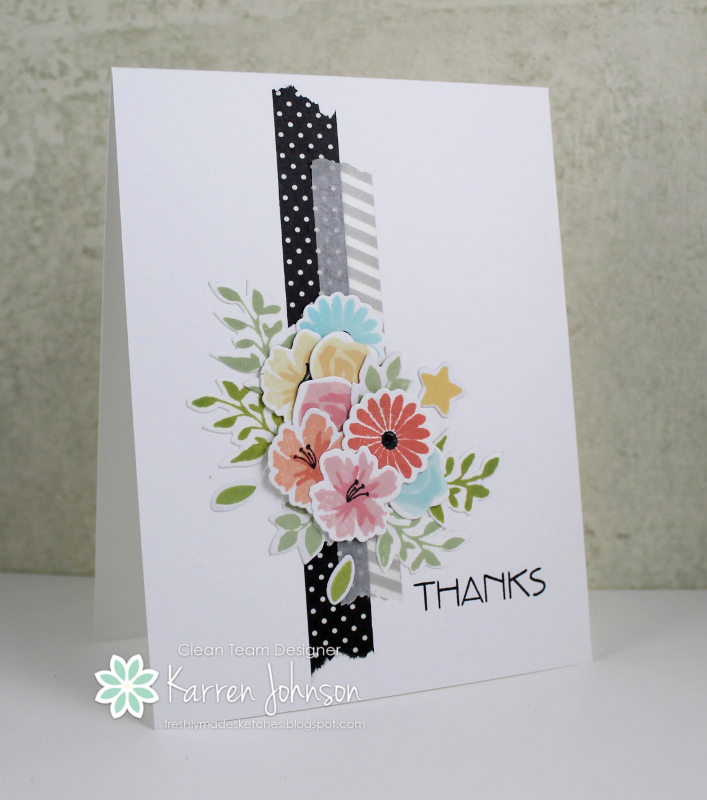 Beautiful bouquet, Karren, and I love the contrast with the washi tape! 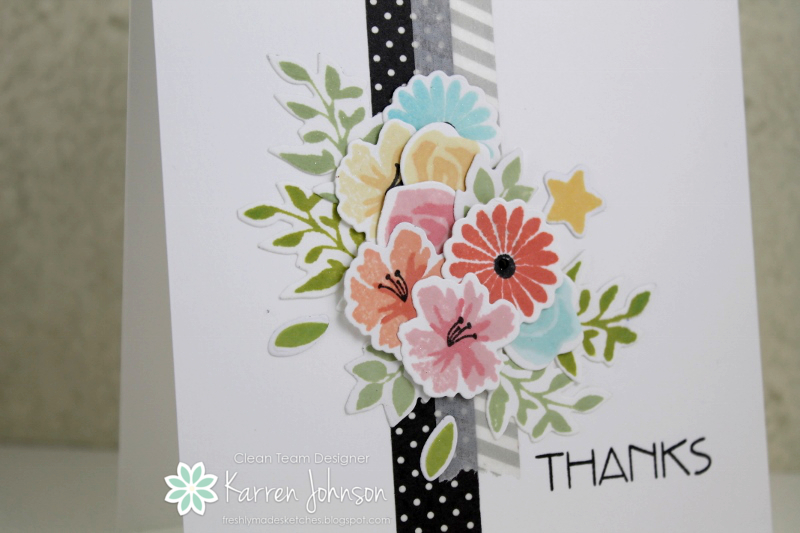 And only you could "throw together" a five minute card and have it be gorgeous! I love it! Love this card! I just recently bought some press 'n seal and it is SOOO helpful when you have lots of itty bitty pieces for a collage! Such a pretty card! Love the bits of washi and that sweet little cluster of flowers. gorgeous take on the sketch, karren! Beautiful flowers and beautiful colors! And I love that sentiment -- cool font. Gorgeous card, Karren! Look at all these pretty flowers! I do love spring!!! Glad we can get a little of it through you!! Gorgeous take on the sketch, Karren! I really love your choice of flowers and the neutral patterns on your Washi is perfect! Loving the font on your sentiment, too...Stunning card! Simply gorgeous take on the sketch Karren! So so so pretty ! Love this gorgeous bouquet. These flowers are so sweet ! Oh Karren! This card is gorgeous. I love that bouquet of flowers and the washi tape! So original and so pretty! Pretty, pretty! That Press 'n' Seal stuff is a life saver when it comes to putting together floral bouquets like this. And I like the washi tape for both vertical layers. The light and dark contrast so well! It might have been quick, but I LOVE it and think it looks like a million bucks. I can't get the hang of those little florals, but I love to see them. What a beautiful bunch of flowers on your card! This is a complete WOW card for me Karren! Those flowers are just stunning against all that white! I have seen it pinned over and over on pinterest as it is such a standout! A large sigh!! So beautiful, words fail me.